Joe Walters, Bob Lund ing and maintenance, as well as inspec- International Ship Masters’ Signal Ship Repair Operations located tion and testing of propulsion systems; Association Conclude Annual in Mobile, Alabama achieved one full overhaul of sea valves and shaft bear- Convention year and worked 387,926 manhours, ings and assemblies; and other routine The International Ship Masters’ without the occurrence of an OSHA cleaning, inspections, maintenance Association 125th annual convention recordable incident. According to Sig- and repairs. 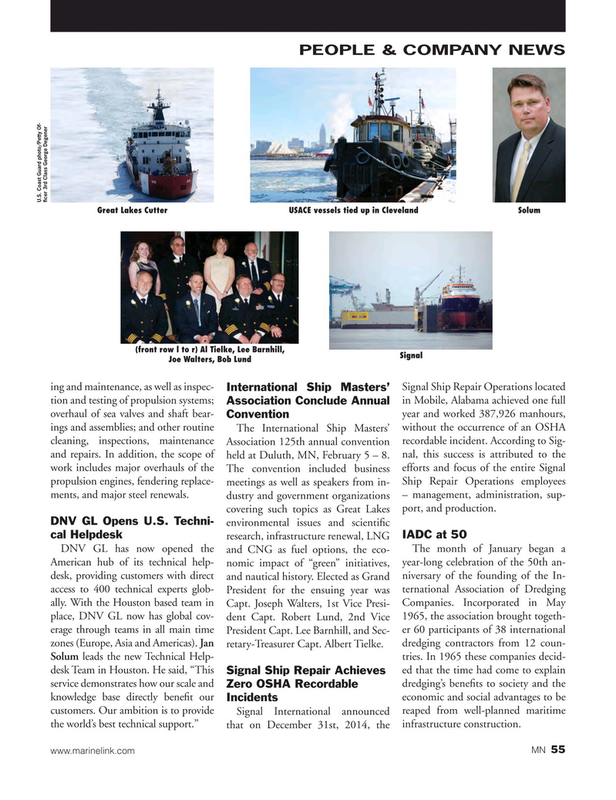 In addition, the scope of held at Duluth, MN, February 5 – 8. nal, this success is attributed to the work includes major overhauls of the The convention included business efforts and focus of the entire Signal propulsion engines, fendering replace- meetings as well as speakers from in- Ship Repair Operations employees ments, and major steel renewals. dustry and government organizations – management, administration, sup- covering such topics as Great Lakes port, and production.